Italian painter and draughtsman. He was a prolific painter who, with a team of artists and craftsmen, decorated palaces and public buildings in Rome, Venice, many cities in Emilia Romagna (especially Faenza), and in France. Felice Giani played an interesting role in the development of the Neoclassical style and was in touch with many prominent people on the international cultural scene. He moved to Rome when he was 20 where he immediately found work in the last phase of decorating Palazzo Doria (1780). Although he was already interested in the classical ornamental repertory, the young Giani flirted with visionary Romanticism . In the work that he produced subsequently in Rome and Faenza (Palazzo Zarchia Laderchi and Palazzo Milzetti, his masterpiece ), the dynamic flair that had characterized his style before 1800 did not disappear. It seemed rather to be redirected toward re-reading classical antiquity in an eclectic way. The combination of a stay in Paris and the Napoleonic years gave his style one final thrust. 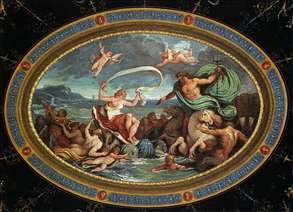 He made a second journey to Paris where he painted frescos in the villa of the Secretary of State of the Kingdom of Italy. This commission brought him international renown and put him in touch with the various currents in French painting at the start of the nineteenth century. Giani s work belongs to the historicist phase that straddled the end of the eighteenth and the start of the nineteenth centuries. His fantasy and ornamental taste took him beyond definitions of Neoclassical or Romantic. See more details about "The Marriage of Poseidon and Amphitrite"